Noting they “received overwhelming support and grant sponsorship from the Ministry of Economic Development and Tourism,” the Bermuda Economic Development Corporation [BEDC] said the SSEP “looks to promote entrepreneurship as a viable career option for Bermuda’s young people to pursue. “The eight week programme – starting on Monday, July 9 and running until Friday, August 31 – will provide students between the ages of 16 and 25 with the resources and support to create and sustain their own business enterprises,” the BEDC said. Erica Smith, BEDC’s Executive Director, stated: “We are extremely excited to be able to roll out this pilot Summer Student Entrepreneur Programme and believe it will provide immeasurable training, resources and support on entrepreneurship to high school or college age students whom might be interested in becoming their own bosses. Through a competitive process, ten students will be selected for the 2018 Summer Cohort, with applications opening today and closing on Friday, July 6, 2018. As part of the application process, students will need to submit a basic business plan based on their product or service, as well as a cash flow forecast and a brief SWOT analysis. To be eligible for SSEP, they must also be Bermudian and have a GPA of 2.0 or higher. The programme was, however, developed to grow entrepreneurship in Bermuda and so the BEDC will consider students who may not meet all the criteria but have a compelling, innovative and creative business idea. Minister of Economic Development and Tourism Jamahl Simmons said, “The Government believes that the spirit of entrepreneurship must be nurtured and encouraged, especially with our youth. “The opportunity to encourage more Bermudians to do for self and create opportunities for themselves and others, will go a long way towards reshaping our island into a better and fairer Bermuda. Naeem Alom, the SSEP Programme Coordinator at BEDC, said: “Our core objective when it came down to designing this programme was to ensure young people were earning a liveable wage through running their own business – be it a snow ball stand or selling their own unique t-shirt designs. “Each of the ten students will receive a working capital advance from the BEDC to help towards start-up costs to help execute their business idea. One week of the scheme will be devoted to workshops and training to teach them the fundamental principles of entrepreneurship. At the conclusion of the programme, the students and their hard work will be celebrated with an Award and Certificate Ceremony. In addition to receiving seed money, and being able to generate their own revenue, awards will be presented to the top three business earners during the summer months, with the first prize winner taking home an additional $1,500. The hope is that, if successful, the SSEP pilot programme will run annually each summer and could potentially also operate year round to provide more consistent opportunities and support to young entrepreneurs. 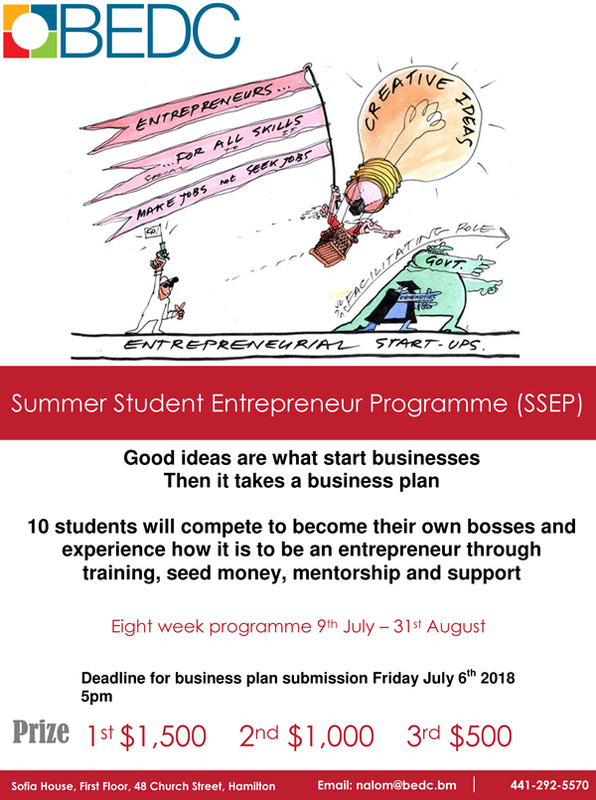 Anyone between the ages of 16 and 25, with a summer business idea they are looking to start-up, can apply for the Summer Student Entrepreneur Programme by emailing nalom@bedc.bm or calling 292-5570. Applications will be accepted between now and Friday, July 6, 2018. This is stupid….. top three business earners? So their idea HAS to generate a profit immediately. Makes no sense. What a photo op, eh Burt? Great idea and incentive for our young people this summer. Nothing like a healthy competition either! If you are a student with a good idea…keep it to yourself! It my be a collaborative families idea formulated through time and actually intended for you to ennact. Do not give your idea to anyone!